When Dean Kamen launched the revolutionary invention he called Segway Human Transporter, little did he know that a few years later, two young men would be taking it out for an unusually long test drive and making it the star of their film. 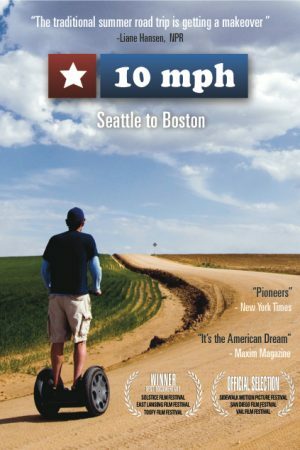 This inspirational documentary tells the story of Hunter Weeks and Josh Caldwell who decided to leave their dull cubicle jobs to travel across the country, from Seattle to Boston, in 100 days, on a Segway. After years of feeling stuck in the muck doing the same mind-numbing and predictable routine day in and day out, Hunter and Josh decided to break free and do their own thing. Life was good, mind you; they had a steady pay check that allowed them to enjoy some of life’s finer luxuries. But they realized that they had given up their passion in exchange for sitting in a cubicle for eight hours a day just for the sake of “stability”. It was not worth it. And so the idea for the film was born. From the very beginning they had to deal with many hurdles. First came the financial limitations. It was nearly impossible to find sponsors and funds kept running out as quickly as they came in. Then one month before the cross country trip was to begin they discovered that riding a Segway is a lot more difficult than it seems. It takes a lot of practice to maintain balance, regardless of its slow speed. In fact, one full day of traveling by Segway covers the same distance a car can travel in one hour. But they launched their expedition anyway. Burdened by a number of discouraging situations, they found themselves on the verge of giving up. Find out what kept them going and how they proved that the only thing truly holding you back is yourself.